Welcome to Lands and Waters South! Lands and Waters South (located in Carrboro, North Carolina) is the southern extension of northern Virginia-based Lands and Waters, a grassroots non-profit organization dedicated to watershed protection and education through the creation of "living classrooms." We offer environmental programs that link classroom instruction with hands-on conservation projects. 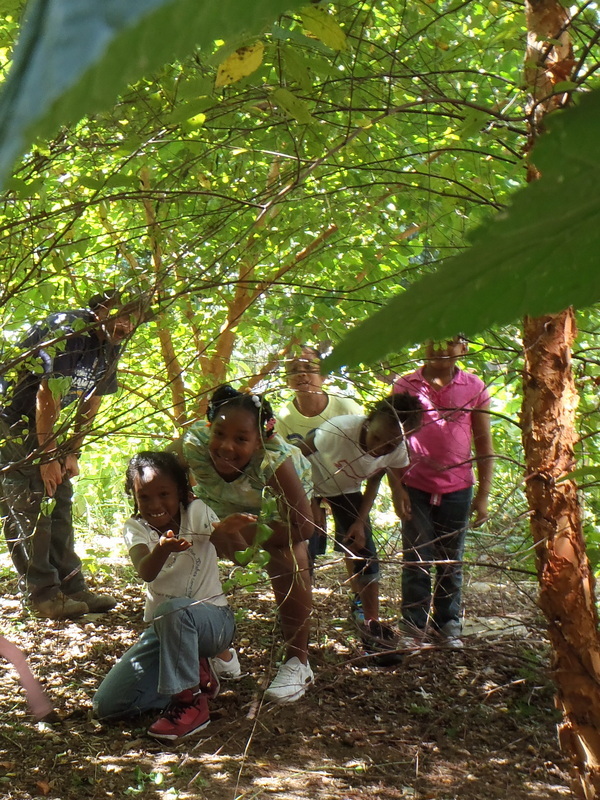 We believe "living classrooms" with strong conservation components are a necessary part of environmental education. Utilizing sustainable landscaping practices that promote native plants, healthy soils, and low-impact development, we design spaces that offer wildlife habitat, curb stormwater runoff, and establish places for students to study subjects including science, the arts, and community/cultural connections. Students are active participants in our work, engaged in every aspect of a project including brainstorming design ideas, putting plants in the ground, constructing benches and signs, and helping with long-term maintenance. Through partnerships with citizens, schools, businesses, and local government, we hope to have a positive impact on both our community and the planet. The restoration and protection of our watershed is the responsibility of each of us and benefits all of us. We invite you to join us in this effort! Students explore beneath the shade of birch trees in their pollinator garden.